We actually need blogs. And if you don’t like the word “blog”, try: column, journal, news update. 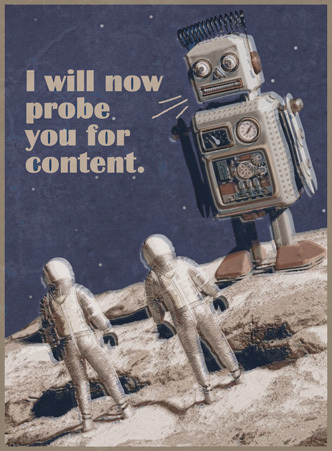 And if your clients don’t read them, all is not lost because robots are coming to your site and are reading and saving your words in their computers. Wait… what?! Yes. Small digital creatures called “web crawlers”; specifically – “GoogleBots” are visiting your site. An invasion? Sort of. These “GoogleBots” find/retrieve your web pages, pass them off to Google’s Indexer which stores your text in a database processed by Google’s Query engine which evaluates them to help determine your PageRank. Your page rank determines your visibility. Words matter. You might be saying to yourself – “but i have plenty of words on my site”. Having static words on your site (About &s, Services, History, etc.) is important but your blog will have fresh content; chocked full of new words that give you relevance within your industry. All of this builds toward an improved PageRank. Update your blog and Google will know you are legit. Isn’t metadata enough? Not really. Sure, go ahead and toss all those descriptive words into your code but Google has moved way beyond metadata. Why? To get around all the hidden links, cloaking devices, redirects, hidden doorways that commercial propagandizers and tricksters created to trick search engines. They now have over 200 signals that measure up your site for credibility. They even know if the text on your site is bogus. Bottom line: the robots will come. Do not fight their probing. Give them relevant, comprehensive, fresh data to take back to the Google Mother ship. Eventually, you’ll increase your ranking and pop up in queries all over the world wide webosphere. Let’s dig in. There are so many other factors that relate to search engine optimization. A blog is only one important component. At the risk of coming off opportunistic, maybe you need a new website. We did. We’re still working on increasing our visibility as a graphic design agency here in Tyler, TX. so we’re taking our own advice. Our next blog should be about design. If not for you, for the robots. Articles like these put the consumer in the driver seat. very important. I learned a lot from this post, much appreciated!